To develop the image and visual communication of a new feature film by Jan Cvitkovič. 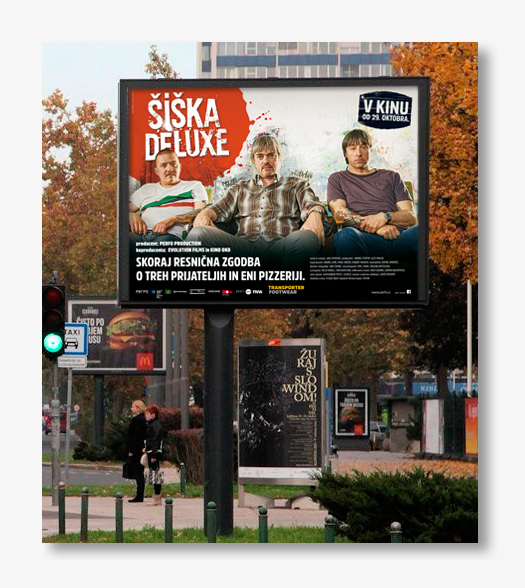 Šiška Deluxe is bitter – sweet comedy about three friends whose stories are set in the iconic part of Ljubljana – Šiška. Since the film is about three friends whose youth is interlaced with a strong ska/punk past, we designed the corporate image of the film in a way that it is reminiscent of the then spray/graphite culture. For further campaigns and the promotion of the film we want to make the so called template, which would help in writing logo in the form of graffiti.